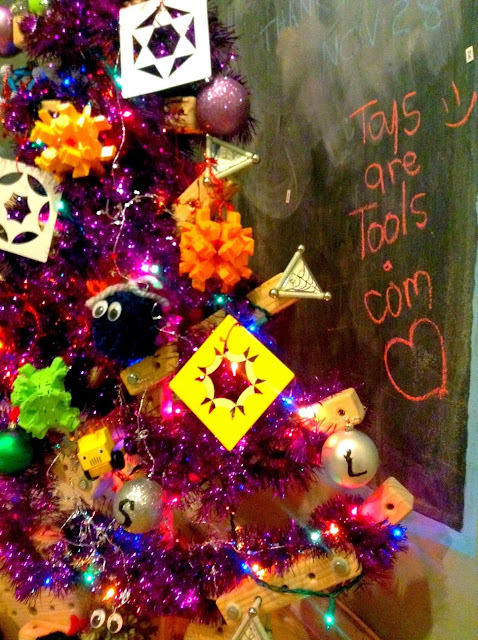 Toys As Tools Educational Toy Reviews: Happy Holidays to Everyone! this season and into the next year! No More Shopping for Today! Pictured: Our tree was made of using almost all of the pieces of the Standard Kit from Woodmobiel, a toy I reviewed in July 2013. This tree was made after 8 months of owning the tree. It looks and works the same ways as the day we received it. Don't forget that Woodmobiel is on sale right now. 25% off. That is huge! Read the full review on Woodmobiel here. Disclosure: TAT received Woodmobiel from the manufacturer to facilitate a review. Reviews are never promised.